I love candy. I'm going to the NJ shore this weekend (or, tonight) and I wanted to bring something for Alex's friends who are putting us up. 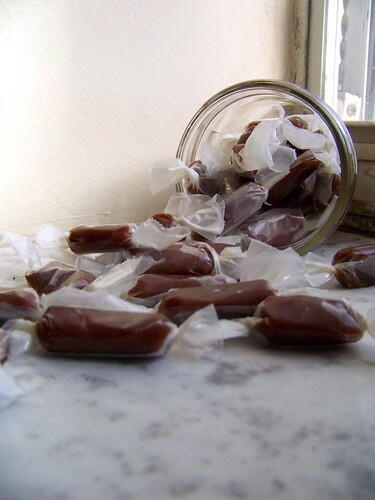 Who doesn't like caramels? Sweet, slightly crewy, melt in your mouth and a little bit of salt. These are pretty easy and hands off, except for cutting them and wrapping them. But you can do that in front of the tv. Except don't eat too many as you're wrapping them, because I did, and now I have a stomachache. Line a 8x8 pan with parchment paper, then butter lightly the paper. In a small saucepan, mix together the cream, butter and salt. Bring to a boil, stir, take off the heat and set aside. In a larger pan, preferably one with high sides, put in sugar, water and corn syrup. Bring to a boil, stirring until the sugar dissolves. Continue cooking, no longer stirring but instead swirling the pan gently every minute or two, until it turns a deep caramel color. Carefully stir in the cream mixture, which will then bubble furiously and you do NOT want to get any of it on you. 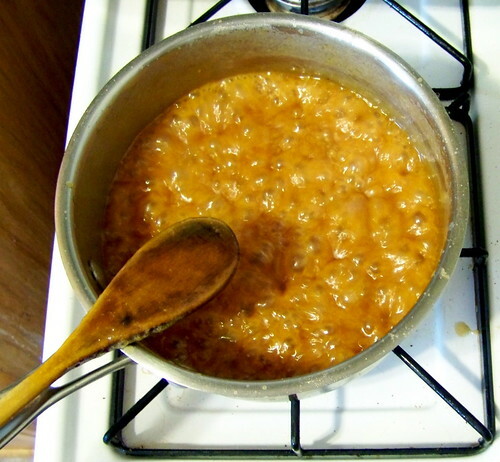 continue cooking for about 10 minutes, until caramel mixture reaches 248 on a candy thermometer. Stir in second teaspoon of salt. Carefully pour into parchment-lined pan, and let cool for 2 hours. 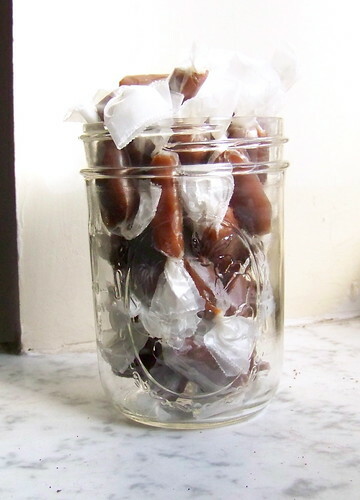 Cut into squares and wrap individually in wax paper.